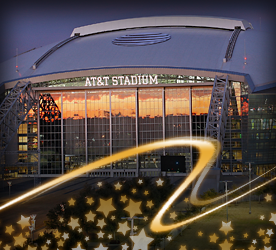 The 50th Annual ACM Awards were held Sunday, April 19th, 2015 at AT&T Stadium in Arlington, TX. Superstars Blake Shelton and Luke Bryan co-hosted Country Music's Party of the Year, honoring country music's best and introducing the industry's emerging talent. It was a star-studded ceremony broadcast LIVE tonight on the CBS Television Network from AT&T Stadium, Home of the Dallas Cowboys in Arlington, TX. The Awards show moved to Texas for the first time ever in celebration of its 50th Anniversary. Fans named Luke Bryan as Entertainer of the Year, the evening’s biggest honor and his second win in this category. The 50th ACM Awards broke the GUINNESS WORLD RECORDS™ title for the Highest Attendance at an Awards Show Broadcast with a total of 70,252 fans in attendance. Garth Brooks, Kenny Chesney, Miranda Lambert, Reba, George Strait, Taylor Swift, and Brooks & Dunn were honored with the 50th Anniversary Milestone Award and presented with an exclusive trophy designed by America’s premier jewelry and timepiece designer, David Yurman. Like the jewelry designs of David Yurman, this ACM trophy is a timeless piece of craftsmanship that will be treasured for a lifetime. Jason Aldean won Male Vocalist of the Year for the third consecutive year. Aldean has won an overall total of eight ACM Awards. Miranda Lambert won Female Vocalist of the Year for the sixth consecutive year, setting a new record for the most consecutive wins in that category. Lambert also won Album of the Year for Platinum, and Song of the Year for "Automatic" as artist and songwriter, that made her the leading winner of the night with a total of four awards. Little Big Town won Vocal Group of the Year award for the second time, making this their fourth overall ACM win. Florida Georgia Line won Vocal Duo of the Year, marking their second win of the night after previously accepting the award for Vocal Event of the Year. They have won an overall total of five ACM Awards since 2012. Cole Swindell won New Artist of the Year Presented by Kohl’s Department Stores, a fan-voted category. This award marks his first-ever ACM Award win. Prior to the show, Florida Georgia Line won Vocal Event of the Year for “This Is How We Roll” featuring Luke Bryan, and Dierks Bentley won Video of the Year for “Drunk on a Plane.” The artists were surprised with the award on the red carpet during the LIVE ACM pre-show. Additionally, GUINNESS WORLD RECORDS™ made several surprise presentations throughout the evening. Alabama has set the GUINNESS WORLD RECORDS™ title for the Most Consecutive Wins as ACM Entertainer of the Year. Alabama was honored with the Academy’s most prestigious honor five years in a row between 1981 and 1985. Brooks & Dunn set the GUINNESS WORLD RECORDS™ titles for the Most Wins for ACM Vocal Duo of the Year, which they won 16 times, and Most Consecutive Wins for ACM Vocal Duo of the Year which they won eight times. Rascal Flatts has set the GUINNESS WORLD RECORDS™ titles for the Most Consecutive Wins for ACM Vocal Group of the Year and Most Wins for Vocal Group of the Year. The band won the award for both of these categories seven times in a row from 2002-2008. Next year’s ACM Party for a Cause® Festival® will be bigger than ever. Extended to a three-night musical event on April 1st-3rd, the festival will take place in the heart of Las Vegas at the MGM Resorts Festival Grounds and feature two-time ACM Entertainer of the Year Carrie Underwood, two-time ACM award winner Dierks Bentley, and four-time ACM Entertainer of the Year Kenny Chesney. For more information go to ACMPartyforaCause.com.